The “Vereninging Bewoners Uilenstede” or Organization Tenants Uilenstede is the tenant organization for everyone who rents from DUWO and lives on Uilenstede. The board stands up for the interests of all tenants at Uilenstede. This happens in different ways. The VBU regularly meets with different organizations and she thinks and decides along with others about the policies of DUWO. Furthermore, the VBU has a commission that regularly organizes parties. See the “activities” here. Also, the VBU acts as an resident committee, which means we talk about notifications by the tenants about defects to the rooms with DUWO. Lastly, the VBU is also a district platform from the municipality of Amstelveen. This means that we also care for your interests as an inhabitant of Amstelveen and we receive a budget to improve the quality of life in the neighbourhood. Below you can read how we’re doing this. What does the VBU do for you? Contact hours: In which you can also lend tools! Resident Initiatives Group , Tell us your idea here! How does the VBU stand up for your interests? The VBU stands up for your interests by using here rights and obligations which come from the law on the consultation tenant landlord (link). This law makes sure that every tenant organization has the right to give advice, the right on information and the right on agreement. Check this link for information (Dutch). Examples of themes are hallway inspections, renovations, service costs and parking spots for bicycles. Examples of themes discussed are safety on campus and garbage disposal services. Examples of themes are new contracts for international students, camera security, selling policy, durability and customer contact. Examples of themes discussed are the prevention of nuisance causing people during parties, giving information and safety campaigns. Examples of themes are the new contracts for international students and introduction days. Examples are case discussions concerning social problems. 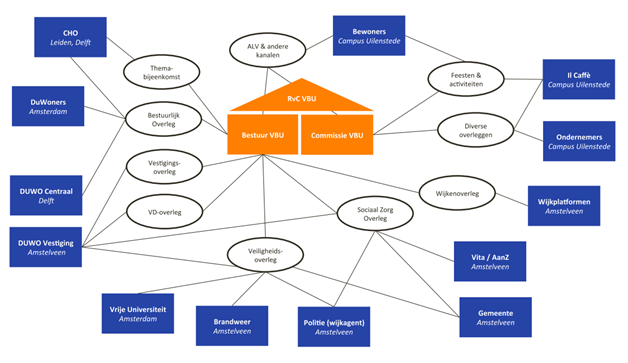 Below you can see an organogram, unfortunately this one is in dutch. Next to being a tenant organisation the VBU is also a residents committee. In this role we have a meeting with DUWO every month, in which we discuss all messages we received from tenants concerning defects in their rooms. (Leaking pipes, inside temperature being too hot etc.). This is about cases where the tenant did not receive an answer from DUWO or isn’t happy about how DUWO took care of it. Are you experiencing defects to your room? Quickly fil out the reparation form from DUWO. If your problems are not being solved or if you experience problems in the way its taken care of you can always contact us! Also, DUWO has a complaints form. There might be cases in which the defects to your room are not being solved or in which you might experience a big problem with DUWO. In the case you no longer see a real solution, you can start a procedure with the Tenant-commission (the website is in dutch. If you need help, contact us!). The tenant-commission is an independent organization to prevent, help, solve and formaly settle disputes between tenants and landlords. The commission makes a binding statement concerning your problem. The cost for a tenant are only 25 euros. As described above the VBU cares for your interests at DUWO. Next to being an inhabitant at Uilenstede and thus a tenant at DUWO, you are also an inhabitant of the municipality of Amstelveen. By being a district platform, the VBU can defend your interests on the municipal level. We regularly have contact with the municipality about living in Amstelveen. Examples are the garbage disposal services, safety, parking policy and public transportation. We also receive a yearly budget with which we can increase the quality of life at the campus. For many years we’ve been using this money to organize the popular festival Thuisfron. Next to the role of district platform, the VBU is also committed to Uilenstede in a second way as a district of municipality of Amstelveen. The VBU is also a Tenant initiatives group. That means that the municipality Amstelveen makes budget available to finance your idea for an activity in the district. This has to be an activity (one time only or multiple times) that is available for multiple tenants at Uilenstede and that improves the quality of life at the campus. Think about organizing a whisky tasting, organizing workshops or a boardgame day. Do you have a great idea for Uilenstede and do you need money to organize it? Contact us! Check this link for more information.